Hotel Casa Valdese Pietra Ligure is a 3-star, seaside hotel overlooking one of the splendid beaches of the Italian Riviera. It is an ideal hotel for couples, families and groups, student field trips and persons with disabilities. The hotel is an ideal base for a relaxing seaside holiday and for exploring the old settlements and towns of Liguria. Hotel Casa Valdese Pietra Ligure is managed by the Waldensian Diaconia and, like the other Case Valdese hotels and lodges contributes, with its revenues, to sustaining the social and assistance services realised by the Diaconia for the benefit of children, migrants, persons with disabilities and the elderly. The Hotel has 36 rooms including singles, doubles, and rooms with 3 or 4 beds - with private baths and air conditioning - in a well-tended family atmosphere that is ideal for welcoming individual travellers, couples and groups, including student field trips. All rooms are accessible by lift. 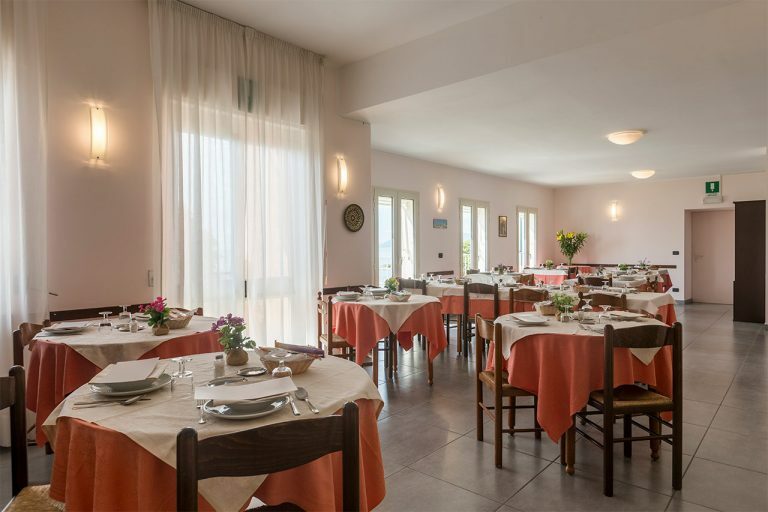 Our meals, based on the typical ingredients and recipes of Liguria, are served in the restaurant rooms with a view of the sea. Guests can relax in the area of the bar or on the terrace with its shaded garden during the hottest hours of the day or at sunset, lulled by the rhythmic lapping of the waves. Our private beach is available to guests and is equipped for persons with disabilities, as is the whole hotel structure. Wi-Fi is available in all rooms.